Published by Cyril Huze June 24th, 2016	in Editorial and Merchandise. These practical commuter and day bags with a durable canvas shell let you tote your gear on and off the bike. These sling bags feature a padded shoulder strap with a cross-chest stabilizer strap that securely holds the bag steady on a rider’s back while on the road. 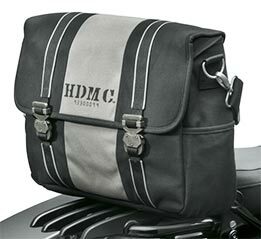 The bag may also be secured to a sissy bar with a wide, adjustable hook-and-loop flap and quick release tabs. 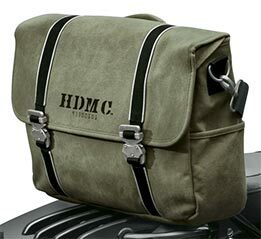 The genuine canvas shell is trimmed with contrasting web straps, distressed metal buckles, bold stenciled HDMC graphics and a comfortable carrying handle. Ready to carry anything to office or class, the bag features an exterior newspaper pocket and a side pocket. The water-resistant inner cavity features a padded laptop compartment that fits most 17-inch screens plus a padded tablet pocket, separate pockets to store cell phones, pens, glasses other small items, and a rubberized port for easy headphone connection. The bag dimensions are 19.0 inches wide x 3.5 inches deep x 13.5 inches tall. 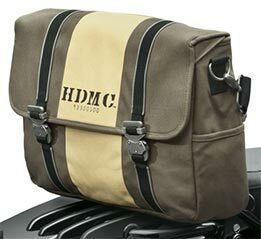 Available in Black & Silver (P/N 93300099), Brown/Tan (P/N 93300100), Army Green http://www.harley-davidson.com/store/hdmc-messenger-bag-pa-02-93300101–1 (P/N 93300101), All $169.95. just to to a military surplus store and get a real one for 20 bucks.